Hope everyone has had or is having a great weekend. Today I (together with my wife and two friends) finally tested the game. None of us has ever played it before and I had read the rules (not too long - just one two-sided A4 size piece of paper) a few hours before the game started. The game is tons of fun. Rules are fairly simple and after one turn everyone knew more or less what they had to do and how to assign toys/special cards to their benefit. In Evil Baby Orphanage players take on the roles of Time Nannies - a highly specialized professionals who travel in time and kidnap little babies before they become real villains in order to "prehabilitate" them. The game is very dynamic and the situation can change from "almost winning" to "totally losing" within a second. I really liked this dynamism as it kept us plugged in. 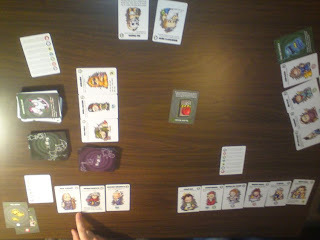 Another thing that everyone liked a lot were the cards or the artwork to be more precise. Evil children look like caricatures of famous historical villains and some of the special rules refer to a given character's history directly.